One of the very first pieces of kitchen equipment I purchased with my own money was a cast iron skillet. The above skillet is the same one that I bought almost six years ago. POOR POOR SKILLET! As you can see, it has seen better days. Generally, if you treat your cast iron skillet well, it won’t get like mine above. But after a few moves and years of use (some improper), mine just got a bit worn. A few months ago I noticed that it was starting to rust pretty badly and by the time I got around to fixing the problem, my skillet was almost entirely rusted out! Now, some people might say that this means I need a new skillet, but oh no. One of the awesome things about these skillets is that with a little work and a few hours, you can bring it back to almost better than new status. I figured I’d snap some photos as I went so you can know how to clean a cast iron skillet also. In fact, if you don’t have a cast iron skillet, you can almost certainly find one at a garage sale if you search around a bit. It’ll probably look as bad if not worse than mine, but with these steps, you can bring it back into good shape. That’s generally good advice because it strips out all the oils that have seasoned the skillet. When we are looking at a skillet like mine though, step one in getting it back into good shape is to very thoroughly clean it. That means getting off all the rust and crud and basically starting from scratch. For this, you’re going to want to pick up some steel wool scrubbers! Steel Wool is your friend. Get some really hot water, a good amount of soap, and a scrubber and really go to town on the skillet. I’m not going to lie, it’s hard work. You want to make sure you thoroughly scrub all the inside of the skillet. Get the sides and the bottom really well. Make sure all the rust is out. It’s going to take 10-15 minutes of good scrubbing to get the job done. The only time soap is okay. After this, your arms will be exhausted, and you’ll have a nice clean skillet. This was mine after about 15 minutes of scrubbing. Looking better already! Of course, the problem is that now this skillet is just a big piece of iron with no coating at all to protect stuff from sticking to it. One of the joys of having a good cast iron skillet is that almost nothing sticks to it. Right now though, this pan is like Velcro. All the little crevices in the iron are going to make anything that touches it stick to it. You can see how it’s kind of a dull black/gray color. That means it’s clean, but not seasoned for cooking. Honestly, the hard part is over. Now we just need to get the skillet ready for cooking. Seasoning, as it’s called, involves cooking a very light layer of fat or oil in the skillet for many hours. As the skillet heats up, the metal expands slightly and the iron basically absorbs the fat. Then as it cools, the oil sticks on the skillet and makes it shiny, smooth, and most importantly non-stick. You can use vegetable oil for this, but honestly, bacon grease is the best thing for it. So assuming you’re not vegetarian, pull out some good fatty bacon. 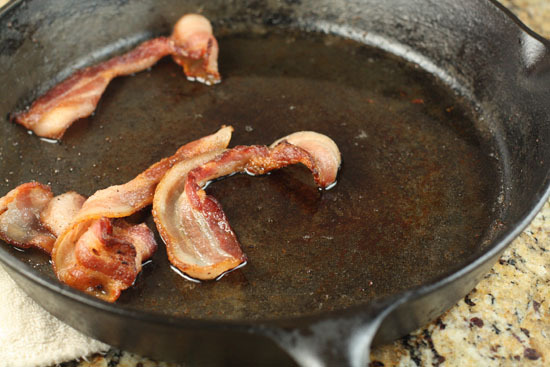 Add the bacon to your cast iron skillet and put the skillet on very low heat. After about 20 minutes, most of the fat should have rendered out of the bacon. You just need the grease. After you have your bacon grease ready, remove the bacon from the pan, pour off the bacon grease and save it, and wipe the pan really clean. Be sure to get any bacon bits that are stuck to the pan out of there. Then, using a paper towel, pour a tiny amount of bacon grease back into the pan and rub it around the pan using a paper towel. There should be a very light layer of oil shimmering on the whole skillet. You don’t want any grease pooling in the pan, just a nice smooth layer covering the whole surface. Heat your oven to 250 degrees and bake the skillet for an hour. Take it out, rub it with a bit more oil/grease, then back in the oven for an hour. After two hours, we’re getting somewhere. Notice how the pan is starting to shine a bit. After two hours of baking. I did this same process two more times. So in total, I baked my skillet for 4 hours at 250 degrees. Generally, two hours will do the trick, but I like to make sure mine is really nice and seasoned. That might seem like a lot of work, but it’s largely hands off. When my pan cooled down, I had a nice shiny cast iron skillet that looks a thousand times better than what I started with. After four hours of baking. Ok. So the real test for any non-stick surface is a fried egg. Once you’re ready to test it out, put your skillet over medium high heat and let it get nice and hot. Add a few drops of oil to the pan and crack in an egg. It should slide around and flip easily, just as if it were in a nonstick pan! I passed my egg test! Cast iron skillets aren’t expensive, but there’s no reason to throw one away if you can fix it like new with a few hours of lazy work, and a few minutes of heavy scrubbing. 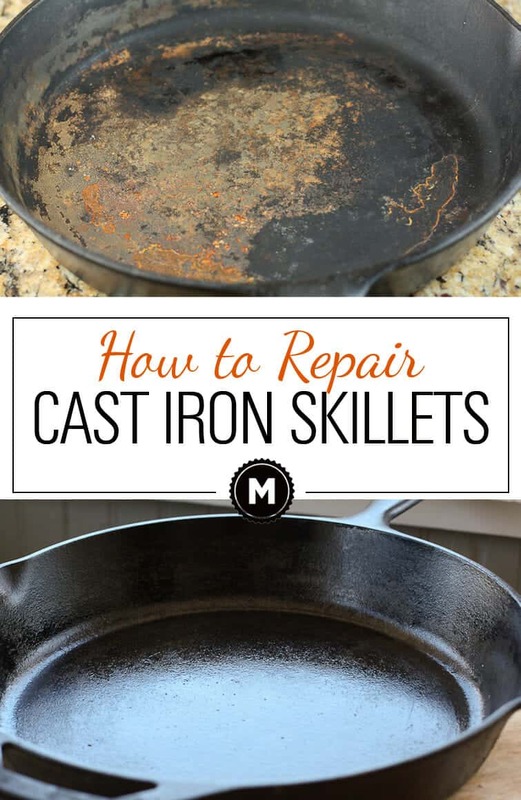 So, if you have a neglected cast iron skillet or know somebody who does, now you know how to fix it up! If you have doubts about why you need a cast iron skillet, here are 10 reasons why you should get one. This used to happen to me all the time back in the day. Some dishwasher would get all up in my stuff, and wash my skillet. Here is another trick if you have some time… and it will help you season your pan faster, and with less scrubbing. Get some rock salt, the really coarse kind. Lightly scrub your skillet, then dry it. Put it over a medium heat and pour the rock salt into the pan so you have like, an inch on the bottom. Once it is heated up, you can toss it in a hot oven. Every 20 minutes or so, you take out your pan, give the salt a stir, and put it back into the oven. You will find that the salt will turn greyish-red. (It is lifting the rust out of the pores.) You need to be a little careful, because the salt will be hot. Then, after an hour of this, you will be able to take your salt out, and scrub with your steel wool on the bottom once it has cooled down. After, follow the other steps you outlined, then all will rock. The salt will extract any oils left in the pan, and literally leave nothing in the pores. That way, when you are rendering your bacon fat, the holes will be filled faster, thus making your patina that much quicker. Hope that helps out man! What about using bacon grease I have saved in a jar? IMHO bacon grease is bacon grease is bacon grease! The real difference is getting to eat the bacon! 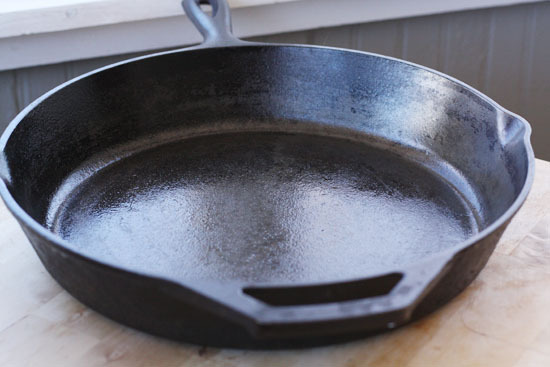 Hey Nick – great recap on how to restore your skillet. The pictures are great too – like new! Was this the first time you did this in the six you've done this? … meant to say: was this the first time you've done this in the six years you've owned it? This was the first time it has rusted completely out. I've seasoned my pan maybe once or twice just by coating it with oil and baking it for like 90 minutes. This was the first time I've had to completely repair it though. Worked great though! I have a colleague — for the sake of simplicity, let's just call her MY GRADUATE ADVISOR — who insists that they don't make iron skillets like they used to. She claims that they are pitted in ways they weren't in times past. I pointed out to her that all iron skillets are pitted and that you fill in this pits when you season them and that the difference between skillets she has seen before and new ones are the lack of adequate seasoning. Of course, she is MY GRADUATE ADVISOR and is never wrong. Did I mention I'm looking forward to graduation? Datkari, Your advisor is right. Not only is the manufacturing process of the pans different, but the iron ore that newer pans are made from is of lesser quality than the pans made prior to the late 1940’s. The older pans were made from iron ore mined from the Great Lakes region and were formed in jeweler’s grade sand molds. Some were even milled to make the inside even smoother. Late to the convo. I believe Lodge is the only cast iron still mfg. in the US. All else is mfg in China. And I think I read that Lodge just sold to a foreign company. The grade of cast iron as well as the method used in casting the product does affect the way the product cooks from the griddles to skillets to Dutch ovens. So hang on to you old iron ware and treat it well, you’re not going to be able to replace it. FYI: Smithey cast iron skillets are still made by hand in Charleston, SC. This post is making me crave the cornbread my mom used to make when I was younger, baked right in the cast iron skillet. Served hot out of the oven, cut into wedges, and topped with honey butter. So good! ok i learned something new today. never ever thought to use steel wool. you did a really good job on this one. Ha! Grill lines would make it harder, but still doable. Toss it in the fire and burn off all the crud, then reseason and off you go. Fine if you don’t mind the possibility of warping. Whoa. Awesome post. Very educational. I sadly don't have a cast iron skillet, so this seems like a lot of work (I'll just go out and buy a new one) but super interesting to learn the process. We have found several at antique stores. Grizwold and Wagner ware are the best of the older ones. Check out your local Goodwill and garage sales, you might luck into a Wagner or Griswold. Wow, I had no idea! Presumably, this would work for woks too? I think so yea. As long as it is cast iron, probably would work fine. Nick here is a less invasive method of removing rust. Go to Walmart and by a plastic tub big enough to hold all the cast iron you wish to refurbish. (I do this in my back yard) Put your cast iron in the tub with enough 1/3 water 2/3 apple cider vinegar and cover. Every day pull the worst piece out and check it out by hosing it down and scrubbing with stiff brush. ((I have had a few “bad boys” that needed a week long soak. When done rinse and scrub with clean water. Immediately do the grease and bake step. I’ve had great success with this and it is easy on arthritic hands. Another hint put some foil on the bottom of your oven and every time you roast or bake pop in a freshly greased skillet (make sure to put skillet on shelf BELOW the food. Saves time and energy. I like your idea…will try it in my backyard summertime. My pans are THICK with crud. Do you have any advice for how to get rust off of a knife? Hmm… I'd take it to a professional to get it re-sharpened. Excellent post, thank you! I recently saw some vintage cast iron skillets at an antique shop and wondered if they would still be food safe…any suggestions for reseasoning/cleaning or do you think they would be good to go if they're not rusted? I would re-do them anyway if I didn't know where they came from… just to be on the safe side. I haven't tried it yet but I plan to this weekend as the seasoning on my pans has been seriously neglected. Really interesting! I'll have to try that next time. Great post! Most advise to bake your greased pan at 400+F which completely smokes out the house, especially if you're using bacon fat. Here's a question, I actually just noticed that the bottom of my skillet is starting to rust a little bit (probably as a result of not drying it properly and stacking aluminum pots on top of it on the counter). Would you recommend reseasoning the bottom as well or does that not matter? It doesn't seem to be causing any kind of smoke or heating problems during cooking so far. I don't think the bottom really matters, but I think you could just scrape it off with steel wool so it didn't continue to rust. I'm not sure there's an advantage to seasoning the outside htough. The advantage would be to keep it from getting rusty. You don’t need the non-stick surface on the bottom, just enough to prevent rust. I frequently (not every use) check the bottom of the pan to see if it is showing any signs of needing to be seasoned. It will either look very very dull or sometimes it will have a very slight rust color. Since I check the bottom frequently, the rust will be an extremely small amount so I don’t worry about cleaning it off. I just put a very very tiny amount of oil on a paper towel & wipe it on then put it on the burner. I usually dry it on a burner after cleaning it, treat the bottom if it needs it, wipe a thin layer of coconut oil on the inside surface, heat it pretty hot, turn the burner off and let it cool before putting it away. If I am seasoning the pan in the oven I treat the bottom like I do the inside surface. In the booklet that comes with Lodge pans they advise you to wipe it with solid oil, inside and out and then put it in a 350-400 degree oven upside down to prevent pooling for an hour. Regarding cast iron… can you use a cast iron skillet on a glass stove-top? Non-regarding cast iron… how did the home brew turn out? Hmm… I think so, but honestly, I rarely cook on a glass stove-top so not positive on that one. Haven't tried it yet.. popping it open this weekend! My neighbors growing up had a glass stove-top and they used the cast iron frequently. So shouldn't be a problem! Look forward to hearing about the brew. I have a Scottish Ale in the primary right now. Yes ,cast iron heats fast ,so less heat ,make sure pan is clean on outside before use. I have a glass top stove. I use my cast iron skillet all the time. Just be careful not to bang it against the top. I use cast iron on a glass topped stove almost daily. No issues whatsoever. As do I. Never a problem. I obviously don’t slide the pan all over the place, but my cast irons all heat nicely on the glass top stove. Not sure why some sources do not recommend it, but with care, it works extremely well!! I have a ceramic top and the cast works great! I got a cast iron skillet for Christmas, I'll have to file this away so I know what to do if it rusts. My cast iron skillets always got washed with soap after cooking any thing in them. The trick to doing it is to wash with soapy water, rinse water off and put in rack to drain while I dry my hands. When my hands are dry I then take several paper towels and finish drying the skillet so that no water is left on it. Then a put a small amount of olive oil in the skillet and take a folded paper towel and spread the oil all around inside and out and then store my skillets in their storage place. Wow, great job. I just posted it on FB for my lazy friends and I'm bookmarking it for myself. I have a couple of pans that could use this treatment. Thank you! Oh, can you eat the bacon? Of course you can eat the bacon, assuming that you have not over or undercooked it. Instead of baking in oven, I use my gas grill……No Smoke in the house. great post! I have a cast iron skillet that is just sitting, not being used, for this very reason. Thank you! I will definitely use this treatment to bring my skillet back to its cooking days again. Congratulations on the nice mention this posting earned you in yesterday's Washington Post — your blogging fame is definitely spreading! I've always done it the hard way, never used steel wool, but I'd use a bit of oil and lots of table salt and my fingertips to scrub out the rust, and then season it accordingly. I just got done using this method to repair a cast iron dutch oven…you definitely saved me! I was so sad to see that my dutch oven had rusted, but then I remembered that you posted this and I knew I had to give it a shot. Thanks! Ohhh thank you so much for this article. I got my skillet a few years ago and knew I was doing something wrong and was about to throw it away! Thank you! Do you use 250 degrees fahrenheit or celcius? Sweet man. Glad you got your pan all fixed up. Definitely one of my favorite kitchen tools once it’s seasoned correctly. I bought a cast iron and thought it was absurd not to wash it with soap. One time I set it in the cupboard and forgot to dry it after I washed it. It rusted, but not as bad as yours. I did the oven thing after it happened, but put the oil layer too thick and it turned into a nightmare of some insanely tough sticky coating. I just scrubbed that out and burned it in on the range, apartment was smokey as all hell but it did the trick. Now after just scrubbing it out with a plastic brush I usually always set it on a burner to med/high until it starts to smoke and oil it. I’ve only had it for a couple years and the thing looks like it’s been around forever. As black as the void. thanks for this! I just got a set of cast iron and it was in my cabinet waiting to be seasoned and we had company who cooked rice in one of the sauce pans and then left water sitting in it…uck…now I need to pick up some steel wool…wish it had been one of the skillets not the little sauce pan! I see some raw knuckles in my future from the scrubbing stage…. 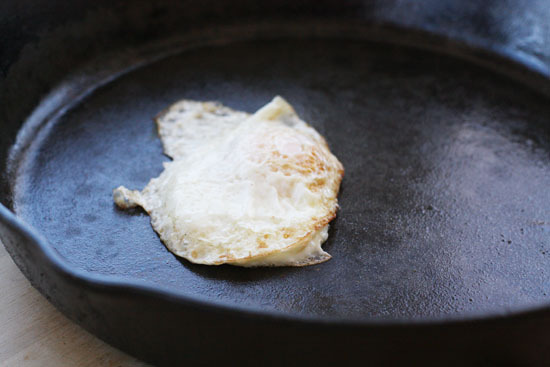 How do you take care of your skillet after each use of it? I just rinse it with warm water (no soap) and dry it well with paper towels. That’s it! I have two very old cast iron kettles I would like to get into a usable state again. The bottom of the one is extremely thin and the other one has a hairline crack and one hole rusted through, the entire bottom also very thin. Can I braze to build up the bottom of the kettle? Any other suggestions, then how can I get the Kettle look nice and black again? Hi Pieter… I doubt that will work. This method only really works for cast iron pans that are thick and you cook on. I think you might just need to splurge for a new kettle. There’s no way I know of to build up the bottom of a kettle. Yes you can braze to build up there bottom of the pan, but you are going to need to pay attention to melting points, such as the melting point of cast iron and there melting point of the material you will use for brazing. Keep the melting point of the brazing material under the melting point of the iron, but above the temperature you would expose the kettle to when cooking. The process of brazing is going to get the iron red hot and it is very likely that if it cools too fast, your kettle will crack along any fault lines in the iron. I seasoned a new pan at 400f years ago and it cracked in half while it was cooling down, so be very careful if you do decide to braze it, and good luck. I recently aquired a cast iron skillet that my mom and dad had for many years. They stopped using it several years ago and though the inside is in great shape, the bottom is showing rust. Is there any hope in saving the skillet? Should be very saveable Joe! Rust on the outside isn’t that important as long as it’s not rusted through or really thin… You can use a similar technique on the outside that I used in this post. Just scrub the crap out of it with some wire wool to get the rust off, then just rinse it off well and it should be usable. You don’t cook anything on the outside so it doesn’t really need to be treated like the inside. I am in the middle of my cast iron skillet repair process. I combined your tips with a few others, and WOW!!!!! My skillet was rusted out, I thought I was going to have to throw it out. Several people told me that I could fix it, but they were not sure how to do it. Thanks so much for your tips. My skillet already looks completely NEW!!!!!!!! I love this! I just bought two cast iron skillets because my grandma owns one and I love cooking with them. I accidently stuck the first one in the disher washer when I knew better and thought I just had to throw it away and I bought a new one. My new one was looking crappy and I was beginning to think it just wasn’t meant for me to own a cast iron skillet. They defiantly are NOT made the way they used to be. I’m trying this out know and I hope it really works! We have a Le Creuset 5.5 Qt round French Oven ( Flame Color ), last week the cover or lid crack partially and some of the paint also was gone. We wonder if you know who can repair the same , of couse as you well know the item in question is in cast iron. Maybe need to be weld and paint. Le Creuset Company does not offer repair service and despite the fact that it was sold as a full lifetime warranty, apparently it would not apply in this case, years back the service and warranty was different. If not do you know who might sale tids or covers, if not a universal lid in metal ( not necessary cast iron ) that might fit the oven. The lid diameter is 27 1/2 Ctms or 10 3/4 Inch and have a lip, the same can be in metal color. Hmm…. that’s a tough one. If Le Creuset won’t honor the warranty you might be out of luck on fixing it. The process in this post definitely won’t work for enameled items. If it’s just the lid though I wonder if you can just keep using it without issue? If it’s a huge crack you might need to find a replacement lid though… check salvation armies and thrift stores for a cast iron lid that fits. It doesn’t have to be Le Creuset obviously… just something cast iron. Find someone with a sand blasting cabinet. Local mechanic maybe. Once it’s sand blasted then season it with oil as stated above. I’ve done this with many skillets. I had a pits and clumps on a old pan. I didn’t have anything to lose so I got a wire brush for the drill and polished it out until it was smooth then seasoned. I’m surprised no one mentioned how my great-grandmother taught me to care for cast iron. After washing the cooking debris out of the skillet with a dishrag, she would rinse it with water, then dry it. Then most importantly it went straight to the stove on a high flame and a little oil or bacon grease was dropped inside & wiped around with a paper towel. I’ve continued to do this with the same skillet that she gave to my mom (and that my mom cared for the same way), and it looks as good today as it did when Gran had it. I have everything I need on hand already and I can’t wait to get started. But I was curious if chicken fat could work as well as bacon? What a steal! Now I’ll keep my eyes open at every second hand shop and yard sale I go to. Amy – chicken fat should work fine. I keep schmaltz in my fridge but it’s never as abundant as my supply of bacon fat. Any fat should work and people have had success with many kinds. I also season mine on my Cajun-style BBQ/grill with offest heat. Excelllent tutorial! Thanks a lot. I’ve collected many skillets and griddles, but never knew how to bring them back to life. My camping trips will be so much better now. THANK YOU, THANK YOU & THANK YOU AGAIN! This gave life back to my cast iron skillet. I was so inspired by your pizza recipe – which was wonderful! Both the restoration & pizza were relatively simple. I have now used my skillet to fry meatballs without sticking or smelling weird. I am a happy cooker! MY QUESTION: I found some old cast iron, really bad shape, rusty, pitted on the outside, inside ok. On the outside, there are raised metal “globs.” I sanded them a little bit, and they are bright, shiny metal. Looks like something (maybe chemical reaction) actually caused the cast iron to bubble up – it’s just a few bumps in a small area on one side. I’m not a metal worker, but I’m going to guess these bumps will have to be ground down. (have to have a smooth exterior for that darn glass top stove). These malformations are maybe 1/16 inch high. What should I use to sand them off? I started off hand-sanding with a sanding block for metal. That’s gonna take a while. Any better suggestion? (I’m thinking power tools). Has anyone ever heard of the cast iron forming bumps? I can’t imagine what caused it! not cleaning it real good. I do not know how to get them off. Nick, I frequently wipe oil on the bottom of my cast iron pieces when I’m applying it to the inside after use. In my mind, rust on the outside will eventually eat away at the bottom of my pan and I’ll end up with a hole. Well, maybe not in my lifetime but I hope to pass my cast iron down to my daughters and granddaughters someday. I have a Weber Cast Iron Gridle I used with my outdoor Weber gas grill. I left the gridle outside by my grill ( in a compartment below it ) for a bunch of months. I checked it recently – it’s pretty rusty and dirty. Would the tips for cleaning the skillet be pretty similar for me to clean my cast iron gridle? I’d love to use it again to make cheesteaks and burgers. Thanks. I bought a cute egg-shaped skillet last summer that was labeled ‘already seasoned’ but within months it began to rust. I have been lining it with aluminum foil and using it only in the oven (almost daily). I was about to retire it when it hit me – google rust repair – and the first site was yours. Your instructions are clear thorough and almost fun and your proof or after-photo looks amazing. So I’m trying it tomorrow and I’ll let you know. I forgot my old cast iron griddle on a burner and the seasoning seems to have burned off to the metal; I’ve scrubbed it with fine steel wool and a plastic brush for a while and it seemed to be clean, no stains on a dry paper towel I used to wipe it after washing. However, once I tried to coat it in grease for re-seasoning, it stained the greasy towel black. Washed it again, but the same thing happened. So, the question: Is that normal or still more scrubbing needed? No, the surface is perfectly smooth. It didn’t heat enough to turn red or warp, either; the color where the seasoning burned off is fairly close to what another old skillet looked like after being scoured clean of rust. More steel wool in my future then, I guess. Thank you for the quick response, btw. and if you’re interested, I can post an update after another attempt at scrubbing it clean. yea… you would probably need power tools. I’m not sure that I would cook in it honestly unless you can get it really smooth and clean. Sounds like something weird happened to it! What do you mean by Very Low. I had my stove element set at 1, just one above Low, but not much was happening and it was obvious the bacon would not be fried in 20 minutes. So I began turning the heat up till it was about 3-4. The bacon did fry then, although it also stuck here and there. Is that bad? Do I need to wash it and start all over again? I think the bacon I used was not fatty enough causing the bacon to stick. Also, I’m trying to season two pans – a round skillet and and a square griddle. The bacon on the griddle hardly generated any fat and I had to add grease from the skillet. So to get to the point, it’s a little hard to wipe a pan clean with a paper towel when bacon has stuck to it, so I used the steel wool again under plain running water, wiped pans dry, added drops of bacon grease, rubbed it in with paper towel, and stuck it oven at 250. By taking steel wool to the pan the second time, did I botched up the seasoning process? Sorry Sina… when I say put the heat on very low… I mean on the stove top, not in the oven. Normally, when I mean oven, I’ll give an exact temperature. Fattier bacon definitely helps because you want to render it down well. It’s okay if it sticks a little bit… at that point the pan isn’t seasoned at all so stuff will stick to it for sure. Just scrape up any bacon bits that are stuck and proceed with the process. Your goal is just to get enough grease to coat the entire inside of the pan. Then you rub it down and put it in the oven at 250… etc. It is not necessary to cook the bacon in the pan you are fixing – I generally do bacon on a flat bacon tray in the microwave for 5-8 minutes depending on thickness and NEVER with a paper towel in there. I get really great crisp bacon and I save every drop of the bacon grease/drippings. I keep it in a can by the stove like cooks have been doing for time immemorial. I wouldn’t think of cooking bacon in an uncured, unfinished pan – I don’t think it would be very appetizing to eat and what a waste of good bacon! my next door neighbor, (50’s ish) picks up rusted iron skillets at every yard sale she goes to. She got a 4qt cast iron dutch oven in horrendous shape,(rusted beyond what I thought was salvageable) for 5 bucks. since we’d been discussing repairing damaged iron stuffs ,she came and bragged on her success . she’d scrubbed it with a clean steel wool pad,rinsed it,dried it, & threw it in her fire pit outside! she let it burn there for hours, when the coals were hot, she smooshed it down into the coals & ash. what emerged the next morn was a surprisingly clean & very surprisingly pristine looking iron pot!! ( I can’t tell you how bad the rust was, it had eaten bits away!!) we talked about re-seasoning,so the next night she had a fire, she coated it in crisco & did exactly as she’d done before. (IN the fire & ash) she showed me a cast iron dutch oven that looked like it had come of the shelf just now. it looked glossy & new. I use my charcoal Cajun-style BBQ pit grill with offset box and chimney to “work” my pans in progress. Thanks for this. I picked up two cast iron pans at a discount shop in town yesterday. They were only $4 a piece. To others they looked like junk. To me a little bit of gold. I had been looking at cast iron pans in the stores here and they start at $50. I followed your instructions and now have two beautiful skillets. Thanks so much! I have a Lodge cast iron that I got about 6 years ago. I was wondering if you think this is a good brand or not. I had neglected it a few years back so came across your site as I’m in the process of restoring it (thanks for such helpful pics and info). But would love any advice about brands and if that really matters much at all. You saved my cast-iron skillet this very afternoon, sir! Thank you for this: I can’t wait to make plum upside-down cake in this thing. my iron dutch oven has survived several deep hard cleaning experiences. now it leaks all across the bottom. is it possible to get it sealed? I have the cast iron skillet my Mother received at a wedding gift in 1939…talk about memories! when I got it out today I saw that it was getting a bit of rust on the bottom so Googled “how to repair a rusted cast iron skillet” and got your wonderful info. The skillet is in the oven as I write. Thank you ! Thanks for the instructions on how to bring my old cast iron skillet and pan back to life. They have been passed down through the generations from my grandmother, at least, but due to my ignorance, were tossed on a shelf in the garage for the last 30 or so years. Accidentally stumbling across these rusted out relics and being much wiser, I realized the fine cooking utensils they could be. I followed your instructions and even though I had to repeat the steps 7 times until no signs of rust were left, it did clean up quite nicely. Thank you. When it came time to season these now clean and shiny utensils, I followed your instructions once again but instead of using oil for the seasoning agent, I used PAM, the spray-on baking release product. I did repeat the seasoning process 3 times using PAM but the cooking surfaces of these utensils came out looking like shiny black porcelain and they have a better non-stick surface than ANY of today’s modern utensils. Thank you for your expert advice and guidance. 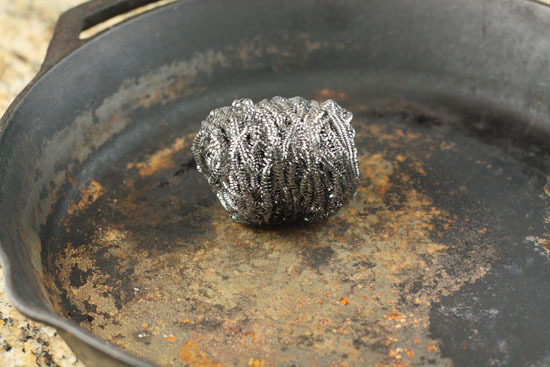 another tip, if you dont have steel wool….add about 2 tablespoons of salt and oil to pan, then scrub with paper towel. I’ve only been seriously researching cast iron pans for about a year, and to say the least this is one of the better articles I’ve read on saving cast iron cookware. how to polish out scratches, if cast dutch oven has been cleaned with a mechanical tool and is now no longer black but a shiny scratched surface can it be repaired ? Hey John, not sure on that one. If it’s pure cast iron, you should be able to re-season it and get it pretty close to new… If it doesn’t work though, then you may just be in the market for a new one. Good luck! I found your article after discovering (rusting away under my kitchen sink cabinet) a set of 3 Lodge cast iron skillets that my parents gave to me about 13 years ago. I did not appreciate them all that much at the time (lesson learned). At first, I was skeptical about whether or not your method for cleaning/reconditioning the cast iron would work, but now I’m sold. I bought some steel wool and scrubbed all of the skillets furiously until every bit of rust was gone. I had some nice cuts of fatty bacon in my fridge, so I cooked three strips of those in the 10.25” skillet for 20 minutes and saved all of the grease for later. I preheated my gas oven to 250 degrees, rubbed the grease all over them (inside and out), “baked” the skillets for an hour, pulled them out after cooling, rubbed on a little more grease, and repeated the process two more times. After the third time baking, the outside of the skillets were a little gummy and sticky, so I baked them for two more hours at 400 degrees (cooling and a little more greasing after the first hour), and they turned out looking like brand new again! They even passed the fried egg test. I used them to cook a scrambled eggs and bacon breakfast this morning – delicious! Thank you for the article and advice. Awesome Scott. That’s good stuff. Glad it worked out for you. I did this step by step just as you said but I used olive oil , I didn’t have any bacon and pan is super sticky! Is this bad?? My only concern is that olive oil has a relatively low smoking point – I would use peanut oil or maybe even coconut oil if you don’t have bacon drippings. Hope you got the stickiness off. It really don’t take long to get your cast iron into cookable state. I have a new skillet that I’ve used a few times. It came pre-seasoned and I’ve added to the seasoning process, but I just noticed some red stains, and they don’t look or feel like rust. Is there something else that could cause the pan to turn red–all i have cooked in it are eggs. Huh! That’s weird Jan. If it’s not rust I’m not sure what it could be! If it were me, I would probably scrub it off and reseason when you get a chance just to me sure. Thanks for the informatiion on how to repair a cast iron. My uncle use to do this for us years ago but he put the cast irons in a woodburner. I was about to give up on my cast iron pan, when I saw your article. I then quizzed my industrious husband about how he cleaned the pan (Yes, I should be thankful.) and he said he used a BBQ wire brush and soap to clean the thing. Helpy McHelperson does it again. Anyhoodles, I now have a non-stick pan and a husband who knows better. THANK YOU a million times. I usually take coarse salt and half a lemon and clean my cast iron pan with that before seasoning whenever I think it needs a good cleaning. Am I ruining it with the salt? That method works fine also Theresa! Instead of bacon greese can I use fatback? Absolutely! Just be sure to cook it over low heat and start it cold in the pan so the fat slowly renders out. Should work fine! I’m wondering about using increasingly finer grits of abrasive paper (with a block on the pan bottom) on a pitted pan. I actually use the stuff to sharpen everyday hand tools and knives generally stopping at around 2000 grit. It’s quick and adequate. Of course, with a badly rusted pan I’d think one might start with a fairly coarse grit, say 100 or so. Care to opine? Thanks! I think that would probably work. I just use steel wool… It would burn through paper pretty quickly but you could probably get the same result. Good luck! But you know what your best secret weapon is? Use the skillet regularly with metal spatulas! As you push the edge on fhe spatula over the surface of the pan, you want to apply some pressure and microplane the surface. Eventually, it should be smooth. Keep it seasoned and fry eggs or whatever you like. It’s incredible! That’s what happens when you cook tomatoes or tomato sauce in an iron pot. It’s the acid starting to eat the iron. Looks ugly and isn’t really good for the pot but it won’t hurt you unless you have hemochromatosis. I got out my cast iron grill pan for the first time in years and cooked steaks for dinner las night. It is one of those long ones that fits over 2 burners. It is full of grease and has chunks of burned on fat. Paper towels will take care of the grease, but what is a good way to clean off the burned chunks. They are really stuck on, and I can’ trudge them by scraping with a table knife. An recommendations for a gill pan that is smaller and easier to clean? Thank you. I bought two really yukky skillets for $3 each and just recently got to work on them. I first put them in the oven as I did the self-cleaning cycle. They were not much improved but got a tip originating from Ann Heller, long-time food editor and Grande Dame of the Dayton Daily News. She said she uses vinegar to clean out rust. I tried it and followed up with a copper wool scrub. One came clean but the other is still pitted. So I put it on medim-low heat on the stove with a lid and with about a half-inch of vinegar inside. I’ll report back. The one that cleaned up is covered in a thin coating of bacon drippings and is in the 250 degree oven. Soak it in lye for a week, neutralize the lye with a vinegar soak, neutralize the vinegar with a washing soda soak (these two soaks only need a few minutes). Then scrub it down good, right to bare metal, and do a complete reseasoning. A lot of work but well worth the results. I just did this with three “vintage” cast iron skillets I bought, except the lye bath was only 24 hours, and then vinegar soak for 6. They looked great after the vinegar – now I’m seasoning, but using the high heat method. Well, the clean one – the 12″ skillet is wonderful. I used it successfully to saute onions and cabbage to make a fantastic reproduction of Olive Garden’s Zuppa Toscana but substituting cabbage for the kale in the recipe. So fantastic that it used to make me want to go to Olive Garden! Now that I have it figured out, why bother? LOL. What happened with the other one? Did the vinegar help? Yes, it helped a lot. It’s just going to take some more work and I hope to get to it soon. It’s possible it won’t clean up but I haven’t found one yet I couldn’t fix. I never would have thought to use vinegar – haven’t seen that tip online but it is a good one. I wonder if anyone has any great ideas on how to smooth a pebbly finish out sooner than by regular use? The 12″ I got at Aldi is just not smooth enough yet and my recent successful 12″ rehab skillet is just so much more tempting to use! I have a 28 inch cast iron pan which is not well seasoned – food sticks on it when I cooked. I would like to season it but the problem is I do not have a oven in which to bake the pan. Can I heat it on a gas stove instead? My concern is I cannot control the temperature when heating over a gas stove? Does it matter? How Long should I heat it? thank you for any comment/suggestion. Hey CW, baking it low and slow is really the best way to ensure an even season over the pan, but if you don’t have access to one I think you could do it. You would want to keep the pan over very low heat. As low as it will go. And if you do it this way I’m not sure that it will really season the sides of the pan. You’ll have to keep wiping the pan down to distribute the fat on the edges and up the sides, but in theory it should work… I would still think that you would need to cook it over very low heat for a few hours to get a good season on it. I just bought a loge skillet and accidentally burned a corn tortilla on it the 1st time I used it. Now it appears that there is red rust marks? Do I have to go through the long process of scrubbing off the rust ans re-seasoning it? I been using crisco for years to season my cast iron. This bacon method has changed my way. Spent the day re-seasonong all my pans. Hi, Well, I did not think my skillet was in too bad of shape. I was looking forward to this afternoon project. All the rust came off. I fried up the bacon and just finished my 4th hour long bake. Unfortunately, my pan just always remained sticky between every bake. I never did get a nice shine. Hmmmm, maybe my skillet was beyond repair. From all I’ve read, you are probably using too much oil when you season and you should NOT use bacon fat for seasoning at all! The salt is a problem along with other issues Flax oil is claimed best by some, google that, I’m going to try it on the ones I’m refurbing now. Maybe crisco or a veg oil. Thank You I will start using the Steel Wool, Vinegar and Baking Soda. Awesome-thank you for the details-love it!! I used two coats of veg.oil on a cast iron tortilla warmer, in the oven for an hour each time on 250. After it cooled, I noticed the surface was sticky to the touch. After setting medium heat on the warmer, I put a tortilla on and it immediately got stuck. I turned it over and tortilla became stuck again. What am I doing wrong? Hey Gilbert, I’ve never used vegetable oil but my guess is that you have too much oil on the pan. I would apply it and then wipe it down thoroughly with a paper towel to remove almost all of the oil… That’s the only thing I can think of! Thanks for your article. Spend all of last evening working on my pan, but I’m still getting a black residue on the paper towel when I wipe it down. What’d I do wrong?! Thanks again for your help. You should be able to rinse it with hot water (no soap) and wipe out any residue. If you keep getting a lot of residue (there is always a little bit honestly), then you might be up for a new pan? Good luck! Thanks for the great advice. I just got a couple of my grandma’s old cast iron pans that haven’t been used in years – she didn’t cook much near the end, and I imagine lifting it was difficult with her arthritis. I will absolutely be seasoning mine with bacon fat – I want it to pass the egg test! I always use bacon drippings with no problems at all. And they are free to me. I would not, however, cook bacon in a icky skillet. That’s a waste. Get a bacon grease keeper and keep it in your kitchen. You don’t have to keep it refrigerated. I have quite a bit of cast iron, newer and old. Some of my skillets got cruddy and the Lodge is rough so I am scouring them and sanding to smooth. I noticed that I have some redish or brown spots that I don’t think is rust as it is seasoned. I noticed the photo on here with the bacon cooking looks the same. I would asume that the pans should be silver or black, not sure what this other color is, maybe it’s turning. This worked and the egg just slipped out of the pan. now how do I keep it in this condition after cooking on it? Janah: after use, just wipe clean. I season most of the time on stovetop. Do not use soap. When your oven is on, a layer of oil/shortening and bake withyour cookies, upside down. Just keep building layers of oil. Looks like I threw away a perfectly good, but abused, cast iron skillet a few years ago :( Question: What do you do to the outside to keep it pretty? Same thing?? Yep! You can absolutely season the outside as well. I tend to not prioritize it on mine, but you can definitely do it to keep them nice and shiny. Good luck! SELF CLEANING OVEN..Save money, energy and time..Our ovens need to be cleaned also right? Put all of the cast iron in the oven and set it to the clean cycle. (don’t overload single layer only) Set it and forget it..let them cool then season with coconut oil. (does not get rancid) This method removes everything down to the original cast iron. Works wonders for yard sale cast iron. Please, please do not put your cast iron pans into a firepit to clean them. Unless the temperature is perfect it is very, I repeat very easy to damage them. When you turn the cast iron a off red color from placing it into a firepit, that isn’t rust. You have actually changed the temper of the cast iron and essentially ruined the piece as it will not season properly again and is likely warped. No sandblasting either!!! Use an electrolysis set-up (google search it, very simple) or a lye soak or over cleaner (same as lye bath basically). I know many people will not see this but I just cringe when I hear about using a firepit to “clean” cast iron! Our CI was accidentally left on an electric stove burner on high and now it has a brownish “stain” in the shape of the electric coils. This is my husband’s favorite griswold so any advice for how to attempt repair is greatly appreciated. Since we are not dealing with burnt on food or rust I am wondering what our next step should be. Hey Johanna, if the stain is on the outside it shouldn’t effect much. Otherwise I would take some steel wool to it and scrub the heck out of it. Since it’s already essentially ruined, you probably can’t hurt it more. Scrub it until you get off all the stain and rust like I did in the photos and then reseason it. I would think that should work but it’ll take some TLC to get there probably. Good luck! I have a pre-seasoned new cast iron dutch oven. After a few uses, I’m finding bits of flakes in my food. It looks as if the pre-season is flaking and you can taste the iron in the food. Could the season be scrubbed off and I could start over? I also have an old naturally seasoned skillet that I love… and have had no issues with flakes. I think you definitely could reseason it but that’s going to be A LOT of work. If you just bought it which is what it sounds like, I would call the company and complain and see if they will send you a replacement. Good luck! There’s really no reason that the bottom of the skillet needs to be seasoned perfectly. You could honestly use soap on the bottom of the skillet without too much worry I would think. That should cut the grease, but just be careful to only wash the outside with the soap/water so you don’t mess up the seasoning on the cooking surfaces. Good luck! I forgot to mention I had left the pan right side up when i placed it back in the oven…i got a lot of it off by just boiling down water and scraping some with a spatula. i did a re season.. and i did cook a pawn of biscuit bread in it today and it came out well…and delicious….but it tried to stick on me…didnt break the crust though..any suggestions?? I just picked up a cast iron skillet today at a antique store for 2 dollars! I’m going to give it some much needed love tonight and save it! Just curious, why not sandblast with a mild abrasives media? Just got my hands on my Mom’s cast iron 10 inch skillet , a smaller skillet and a griddle. My Mom has been gone for 4 yrs now and these items have been packed away. All have rust. So the work begins. Thanks you for all the advise. Can’t wait to see the finished product……..they items mean so much. I remember her cooking our meals in these skillets growing up. Thanks again! Hi Nick! I’m a new reader and I’ve found you while researching about the cast iron skillet. I bought one specifically to make Tarte Tatin, and only after found out how useful it could be. It’s a Lodge but I got it at TJMax and it didn’t say whether or not it had been pre-seasoned, so I followed the instruction from this post of yours (https://www.macheesmo.com/2010/07/ten-reasons-for-cast-iron/) and used canola oil and baked it. I cooked some Mahi fillets in it and they stack a little bit, so I decided to do the precess for rusted pans and did the bacon thing. It worked like a charm and i immediately try the home fries. None stack :) I still have a couple of questions though. Exactly, how do you proceed with the pan? You cook in it, then wash it with hot water and scrub without soap, the dry it and spread a little canola oil? And then use it again? And if it get rusted or once in a while, you do the bacon thing as a sort of maintenance? Is that right? The question is… if season it with bacon and cook fries or fish in it, am I supposed to use a different pan when i want to bake a sweet dish in it? Will it taste of fish or bacon? Or it won’t and I can use the same pan? I checked as many comments I could in order not to ask the same question again, but couldn’t find this one. I know this post is hold, but it would be really helpful if you could answer it. Love your blog btw, and found a lot to do with my new cast iron! I use the pan pretty much like you describe. Once it is seasoned correctly, flavors won’t really stick to it so you can switch from savory to sweet without too much worry. When I’m done cooking it in, I rinse it with hot water well (no soap) and use a scrapper to scrape off any bits and then I wipe it really clean with some paper towels. That’s really all I do! Every once in a awhile I’ll add a bit more oil to it to give it a fresh coat (or just cook some bacon in it for breakfast). Generally, I have to reseason mine completely ever few years also. Good luck! I have a griswold skillet with pitting. Is there any way to restore it back without damaging the pan? What causes the pitting besides neglect? Thanks in advance. Hey Michael, griswold skillets are nice. As far as I know there isn’t a way to restore a pitted pan. I’m not sure what causes it to pit, but I think it’s usually just years and years os improper care/storage. If the pitting is on the outside or minimal on the inside it’s probably not a big deal. There’s no reason why you couldn’t still use it if it’s seasoned well, but if it’s badly pockmarked it might move from the useful to the display only category… good luck! My problem is not rust but I left my skillet on with something in it till all the liquid went away and now I have a strange flat black build up that doesn’t scrape off even with my trusty steel spatula. Do I try the steel wool treatment? Thank you. Hey Susan, that’s a bummer. I would give the steel wool a shot because you have nothing to lose. Worst case, you can’t get it off and the pan is garbage. Best case it cleans up just fine and you’ll just have to reseason it. Good luck! Can always put it in the oven on self clean. After a few hours and a wash and scrub you can reseason your pan and use it again. Don’t get rid of it!!! I think my son put my skillet in water when it was hot and there is what I call a island is on the bottom. I used vinegar on mine – hot – boiled it mixed with some water then used a scraper…also used some soft scrub for the really nasty ones…once skillet is in use, coarse salt is great to clean it! All that is is carbon. If you have a self-cleaning oven, just invert the pan on the middle rack and leave it there while you run the oven through its cleaning cycle. Afterwards, wipe down with a damp cloth and you should be back to bare metal and ready to re-season – by whatever method you prefer. Personally, I just rub the pan down with Crisco and pop it back into a 350 degree oven for 2 hours – again, inverted so the excess shortning runs off rather than puddling. I do not have a self cleaning oven, but I do heat my house with a woodstove. My wife and I have a griddle that was so built up with carbon deposits it was like layers of shale and we didn’t use it any more. I threw it in the woodstove when it was hot embers and it cooked it clean, just dust remaining of the buildup. Seasoned the griddle and it is like new. The intense heat might crack or warp inferior metal, so beware, but I took the chance because the griddle was unusable anyway. I have since cleaned up a rectangular griddle this way, too. I notice the casts that I cook tortillas or pancakes on tend to build up carbon more than those which foods are fried or sauteed or meat is cooked in. A FEW WORDS OF CAUTION ! The ‘Use & Care’ instructions for my range/oven state that the racks which are stainless steel “must be removed” from the oven while operating in self-clean mode. Although stainless is very durable & the racks would have to be cleaned separately from the oven, the extreme heat generated may & is highly likely to cause the racks to warp. Just saying……. While I’m here I’d like everyone to know that pitting inside your cast-iron is not a good reason to junk it. I have a very old oval baker that came to me with pitting across the entire bottom on the inside, some of them a good 1/16″ or better deep. A good scrubbing & seasoning is all that was necessary to cook non-stick in this pan, cornbread at that & everyone where I come from knows that a pan that will do that is a keeper. No, the pits will not ever fill in & smooth out in the bottom of the pan but they don’t need to. do you put anything under skillet? Foil? No, you do not put foil in the oven while running the self-clean cycle. As a matter of fact, the Use and Care Manual to my range instructs you to remove the racks and clean by another method as extreme temperatures are reached that can damage even stainless steel racks( which is the material of choice for oven racks) over time. Carbon will dissolve into alcohol or vinegar. If the pan is that valuable or dear, finding some cheap, strong vodka or acetic acid (stronger than household vinegar, but DON’T GO HIGHER THAN 10%!) could do the trick. Scrubbing (and gloves!) will still be necessary, but these will be far more effective at removing char than soap and water. If you’ve got a self-cleaning oven, put the pan in there and let it roll. At the end of the cycle, everything stuck to the pan – and I mean everything – will be ash. The pan will look pretty rough, but wash it and scrub it with some steel wool to clean it up. Dry it off, and re-season. Good as new. Did you find that after you got them out of the oven there was a residue? I can’t seem to wipe my clean without rusting them! A friend once told me that the best way to clean a “cruddy” iron skillet, is to put it in a bonfire, when one is “happening” in your area. The heat will clean all the crud (much like the “clean” cycle on an over), and your pan will be ready to re-season. Sounds like a plan, to me! Hi there. Cast iron skillets are the best cooking implements ever. I clean mine with hot H20 and some kosher salt. Cleans like magic. Papertowel stick to pan why? your pan sounds like it has residue (old oil) stuck inside I would warm it up and scrub taking it down to 1st time use. Then reseason it. I use Crisco on paper towel wipe it down (use sparsly) put in 350 oven 2 hours let it bake remove it once or twice to re coat with Crisco be careful its very hot put back in and bake the method she uses in this article is what my dad did and I have done it for years. I wouldn’t do it on skillets that come from China or Korea the metal isn’t the same. this happens when a pan is put away with LOTS of oil in and on it then it sets for a while it won’t rust but the excess oil becomes sticky things tend to stick in it too. I think 350* is to hot 250 and the 4 hours is best I’d lightly oil it every hour or so. I read on Pintrest Flax seed oil but it must be pure, with no other additives they said health food store refrigerate the oil. Or good ole bacon grease, I oil mine after every use but never use a lot at a time residue or pooling is not your friend. Don’t uae flaxseed oil. I went on Wagner website, my pans are from Wagner. It says to use Crisco, the solid white stuff. My pans are great now. Give it a try. I have rust and flakiness on the underside of my cast iron. I reasoned the inside which worked great, but what should I do about the outside? Once your skillet is seasoned, what is the proper way to clean it since you suggest avoiding soap? Very coarse salt works great! I’d go with the potato – salt promotes corrosion in most metals. Rub it with the cut side of a raw potato, wipe out debris, then rinse with HOT running water. The starch will dissolve and run off almost immediately. I found a newer, used cast iron dutch oven, and tried to deep fry chicken right off the bat. It started smoking befor I could even continue cooking. Now there are black scorch marks on bottom half outside, and inside, with dark grey on top half. I have attempted to reclean, and season this and it stinks of burnt rubber with slightest heat. I have NEVER seen this with any of my cast iron pans and am worried its beyond my repair. Any help would be great. I am getting sick of this horrible smell. Hey Christy! That sounds pretty bad. I’m not sure what would cause a rubber smell unless it was something the previous owner did… I would say to bust out the steel wool and crust it completely down until it’s a fresh layer and then reseason it from scratch. Unfortunately you’ll probably want to do the inside AND outside as the burning could be on the outside of the pan. After you reseason it, if it is still smelling and smoking then it’s probably trash. Good luck! Hi Christy! I know what that is. The pan & it’s lid were waxed to prevent rust, I have one that was prepared in this manner; the wax in question is food grade but not something you want to taste & boy is it ever smelly while it’s burning off. Before you can cook in the utensil the wax must be burned off, scrubbing is not going to effectively remove it. I’m afraid you’re going to have to endure that horrible smell just one more time. To begin, line bottom oven rack with aluminum foil, place pan & lid upside-down in oven on upper rack to allow the wax to drip out/off of the pan & lid. If there is not enough room for both pieces of course you’ll have to do them individually. The next step is VERY IMPORTANT!, turn on the exhaust vent over your stove/oven & if there is a window near-by you may want to open it. Heat your oven to 350 degrees F. Now it’s just a matter of time, how long depends on how much wax is left on the pieces. There is going to be smoke generated as the wax melts off, when the smoking stops you’re done. Now you need to wash the pieces with warm soapy water, rinse well & dry thoroughly then proceed with seasoning. Why couldn’t you just do it outside on the grill? A grill won’t get the metal hot enough to melt/burn off all the wax. Grills are usually calibrated to flame temperature, not the air temperature. When you set an oven to 350, you’re getting 350-degree air around your food & cookware. Mine are rusting before re-seasoning and I can’t seem to get them clean…tips? You might want to try seasoning with Lard. That seems to season the cast Iron better. My Skillet has a bevel in the middle. It will not sit level, any sugestions. I know how you feel. I just bought new Pioneer Woman cookware that came with a preseasoned cast iron skillet. I just wiped it out to free it from dust and made hamburgers in it. It smoked and stunk something aweful! And talk about turning the meat black and not burning! I cleaned it afterwards and the black just would not come off. I used scrubber sponges until they were black, threw them away and got another. After 4 ruined sponges I used a steel wool pad. Finally the black was gone and when the skillet dried it was nasty grey and some rust. I was gonna throw it away but now gonna try these suggestions…I hope my skillet can be saved! I have a Paula Deen dutch oven that did the same. After many uses that faded but the pan sticks. I I decided to put it in the wood stove like i did my old skillets and the results were awful. My old skillets cleaned BEAUTIFULLY, but this thing feels like a Lava rock! The outside turned shades of red and blue. All I can say is that it must be inferior metal. What a waste. I have a cast iron skillet that food was baked in and leftovers not removed for a couple of days. Now the bottom of the pan is “spotty”. It looks like discoloration spots. How can this be fixed? It is a new skillet that was purchased about 9 months ago but has been used quite often. Hey Lisa, if the spots won’t come off with a plastic scraper, you probably need to reseason the pan from scratch. Scrub it down with steel wool until it’s fresh and then reseason it like I do in this post. It’ll take a few hours of work, but should do the trick. Good luck! What if your pan is bigger than your oven any suggestions? Hey James, since you are just rubbing on a thin layer of the oil you could put a baking sheet under the skillet and tilt it a bit to fit more vertically in your oven. You might have to remove a few racks to get it to fit. If it still doesn’t fit then I’m out of ideas! You could also use your gas grill to season/bake a pan. I just bought my pan, ‘pre-seasoned’; it obviously needed some additional work. After watching a couple videos, I used Crisco on the inside and outside of the pan – now it’s incredibly sticky. Help! Also – if one uses soap, won’t the soap get into the pores of the pan when it heats up? Crisco should work okay but I usually prefer a more natural grease, like bacon fat. Any fat or oil should work though. If it’s sticky, you probably need to apply a more thin layer and bake it longer. Since soap will kill the fat bonds I never soap my skillet unless I’m completely reseasoning it anyway. Check out the date on your Crisco sounds old.. Bacon grease is very good but these days people look down on you for suggesting it. 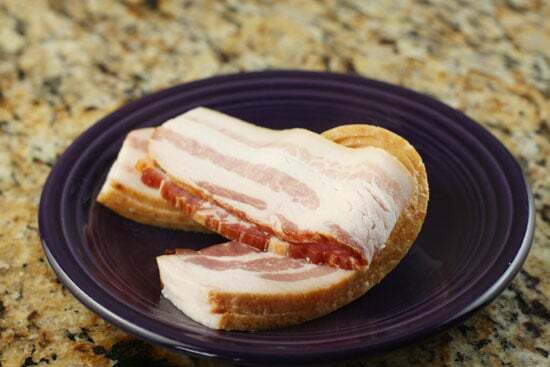 You need to remember that alot of bacon has sugars in it. That will make you cast Iron sticky. If you can find fresh bacon that will work great. I washed my cast iron skillet, dried it, put on some canola oil, turned it upside down and baked it for one hour at 350 degrees. The skillet came out so sticky. So, I washed it, this time with a stiff brush and a little soap, dried it, added the oil and tried again to bake it for one hour. Now it’s stickier than ever. HELP! Hey Nicki… I think the problem is two fold… one, you are baking it at way too hot a temp. 350 will possibly burn the oil rather than infuse it into the pan. In the directions, I recommend 250 degrees F.
Also, I usually bake mine for a total time of four hours. Yes… it’s a long process, but just an hour won’t get you anywhere. Hope that helps! Just to let everyone know, when I was little bitty my uncle found 12 assorted sized cast iron skillets in the corner of a barn about to be torn down and rescued them. He asked my Mom to render about a pound of bacon and sieve the fat. Then he used the hose to wash the dust and chunks of dirt off of the skillets and left them to dry outside, upside down (so the water couldn’t pool and cause more rust). He left everything alone until the fire burned out and the skillets cooled completely. He washed them all with a metal scrubber and seasoned them all with the bacon fat inside and out. I would recommend doing this to everyone if you have a way to burn those crusted up skillets, charcoal grill or campfire, give it a go. If that crusty/sticky/smelly skillet is going to be trashed anyway and you have the capability, what is the harm? Love cast iron to cook with. I’ve seasoned just as you do for all of them and for some reason, some seem to take better than others. I assume it’s from years of either caring for them correctly or not. I’m always on the look out for barn sales because you can find very old, odd pieces that I would love to know the history and what was made in them from years ago…if only cast iron could talk! wow, great post. I bought my FIRST cast iron skillet yesterday. I guess I’ve already made my first mistake. The first thing I did when I brought it home is I washed it with soap to get rid of some of the dust it had on it from laying around in a store. So, if you recommend to never ever clean it with soap, what do you clean it with between uses? Also, when you buy it brand new, is it already seasoned? Hey Maggie! Most skillets come preseasoned these days. For me, after I use my skillet I rinse it thoroughly with very hot water and use a scraper to scrape off any food bits on it. Then I wipe it out with a dry paper towel. That usually does the trick and keeps it in good shape. Some people also like to rub a very tiny amount of veg oil on it in between uses. Good luck! I use an old wooden spoon cut it straight across I broke the spoon part some how any way I put about an 1/8 cup of water in it heat it up, and use the spoon to push the food stuff around, then wipe it out with a paper towel. Or when I am cooking the last couple minutes before I remove the food I use the spoon to deglaze the pan put meat on a plate set it aside scrape the bottom with the spoon and wipe out with paper towel. I also wipe the pan with grease and put in the oven. That’s where I have to keep all my pans I use every day. There are plastic scrapers but I forget to turn my pan off and heat up my fingers, so the long handle of the spoon works great I use the heat to my advantage. bought a used skillet: cleaned it and found on one quadrant the iron isn’t smooth but has little sharpish bumps. How do I, and what do I use to knock these down level with the bottom of the pan? Hey Bev, steel wool is really the best way. If it is super-pockmarked then it might not be salvageable though. Good luck! Oh and PS… you don’t have to completely get rid of the bumps. Some skillets have them after years and years and still cook just fine. Just be sure to get off any rust and give it a shot. It might be just fine! I have a box of old cast iron cookware, 30 minutes a pan would take 2 days, what do you think about sand blasting them? Hmm… that might work for cleaning, but you would still want to season them by baking them with fat rubbed on. If I were you I would sell the ones I didn’t want as-is and then reseason just the ones I wanted to use. There isn’t really a reason to have that many cast iron pans. A few different sizes is all a normal kitchen needs. You all are doing the hard work and even probably discarding really good pieces. Just stop by Ace Hardware store and get a bottle of rooto drain cleaner (100% lye), then grab a bin with lid and pour in 10 gallons of water, pour in the entire bottle of lye crystals (1 lb) and mix with a stick. Use rubber globes as this solution can burn your skin! Let the skillet set in completely submerged for 1-3 days. The lye bath will remove all grease, old seasoning and crude that has build up over time. Check daily as some are done within a few hrs and some need 3-4 days plus some scrubbing. Once ready just bring it in under hot water and wash it throughly. Lye will wash off completely and gets neutralized by water. Then scrub it as needed and even use soap if you wish. Dry it fast to avoid rust and you can give it a coating with crisco and bake it in oven at 350F for an hr. That it! don’t sweat it! You can keep the lye properly covered for future use for up to a year. i want to try your method of cleaning. My mother in law has a cast iron griddle that when used leaves a horrible chemical taste on food. Also, I think it has build up on it. My question Is how do you dispose of the water and lye mixture? Hey Tressa, I’ve never tried the lye method and haven’t heard of others that use it. Lye is pretty toxic and hard to handle and an extra step that you really don’t need to do. If you just scrub the griddle really well as I describe in the post and reseason it, it will probably be fine. Good luck! After reading the directions, the only safe way to dispose of the lye solution is with 90 more gallons of water down municipal sewer drain (NEVER PUT THIS IN A SEPTIC SYSTEM!) . Neutralizing the mixture is dangerous and not something I would recommend to someone without solid knowledge of either chemistry or HazMat handling. It should also not be put into irrigation or runoff water nor dumped in a field. Lye can poison drinking water and render land infertile. Do not use a plastic container to do this as the water will get extremely hot when you add the lye! Also remember to wear gloves and eye protection and always add the lye to the water not the water to the lye. Correction: 5 gallons of water. Add the lye to water and not the other way around! I burned food onto my skillet and had to scrub it down hard. It is becoming more seasoned however I have pitting on the bottom. Do I season the skillet with the pits or try to get rid of them? Hey Cheryl, you probably won’t be able to scrub out the pits if they are deep… You can still use the pan for many things with pits if it is seasoned correctly. If it’s causing a lot of issues though, it might be replacement time… Good luck! Due to my ignorance, I think I have mishandled my newly bought lodge skillet. It was exposed to high heat on the stove and now has a huge black burnt mark in the pan. Any suggestions how the skillet can be salvaged? Also, I don’t own a oven, how can I season the skillet on stovetop? Thanks! Thanks Nick for your prompt reply. I can try steel wool to remove the burnt marks. Since I can’t season the skillet without an oven, Is it ok to warm up the skillet and apply shortening after each use? I don’t know where you are in the country, Nancy, but I sometimes season mine in my charcoal smoker/grill. That might do the trick Nancy. Probably worth a shot! I have seasoned my skillets on my gas stove top. Grease the skillet, lowest heat on stove top, keep it on for about an hour. Repeat everyday for about 4-5 days until the skillet is uniformly black and shiny. Works like a charm. Hey Mal! I would say try to cook something simple in the pan and see how it goes. I don’t think the stain is necessarily bad but the only way to know is to try something like an egg in it. If it sticks or affects the food then you’ll want to buff it out (you’ll probably need something like steel wool) and then reseason the pan. Good luck! Thanks for the how-to…thought I knew all there was to know about “seasoning” my cast-iron pan, but when I couldn’t remove the black flaky stuff (no rust) that I’ve now learned is carbon deposit, I went in search of a solution and found your website. I’m going to try the inverted pan plan in my self-cleaning oven. Can’t wait! Thanks for the good advice! I have two cast iron tea kettles which we fill with water and keep on our wood burning stoves. They help to get some moisture in the air. They tend to rust both inside and out. I did season the outside at the beginning of the winter and tried doing the inside but did not have too much luck. Any tips you might suggest for seasoning the inside. Put about a half teaspoonful of oil in the water and keep an eye on it. You may need to adjust the amount added and how often you add it. Just experiment. You can’t hurt anything. I would suggest mineral oil. Do you drink from the kettles? You might even be able to use scented oil but that would be another step in the process. I’ve sand blasted some natty ones. Then a good seasoning. Nice and happy. I bought an unmarked skillet from ebay that had been cleaned and lightly seasoned. When the skillet arrived it was a light muddy brown color and smelled of metal. Iam afraid to use it because of the smell… should I clean it with soap and water? What do you suggest? Hmm… yea… that sounds weird Elaine. I would scrub it down really well and reseason it. Probably be fine! I have done a few pieces of cast iron using the self cleaning oven method. Then I put the item in a sink with two gallons of cheap white vinegar. The low pH of the vinegar removes traces of rust. I often scrub with some coarse steel wool while its soaking. Next I have my oven at 380 degrees. I pull the cast iron out of the vinegar, dry it with a cloth towel and give a a very light coat of cheap part animal fat shortening. Back into the oven for an our, upside down so it can drain. I pull it out, wipe it with a cloth and again with a light coat of cheap shortening. After about the third time I have a nice even seasoning on the skillet. I only do the outside of the utensil one time. I have an old skillet at home and I thought that I should throw it away. Thank you so much for this article! Now I know that there is a chance to clean my skillet and to use it again! Carlshalton Carpet Cleaners Ltd. So so happy to have this how to article. My husband and I are going on a hunt for an old skillet in order to do this, rather than going out and buying a new one. This seems so much more satisfying. Thank you for posting and for adding the great photos. Do you think your tip for cleaning cast iron pots would work on my black iron stove tops? They have burned on grease build up that I cannot scrub off no matter how hard I try. Oh gosh… I have no idea on that one. I would look for a stove/appliance specialist in your area and consult them! I have such iron skittle at home but I was going to throw it away because I thought that I can’t bring it to live. Thanks a lot for this incredible article! Regards!Eden Park Carpet Cleaners Ltd. I used a heavy duty oven cleaner and placed pans in separate trash bags and seal for a few days . they just wiped clean with rags or paper towels. then a wash with 2;1 water and water vinegar. rinsed with water wipe dry with paper towels then season with lard. I got a new lodge skillet and didn’t take the paper/plastic off and put in the oven for when I could get to it. I forgot and preheated my oven to cook something else and realized too late I had left it in there. The sticky/gummy stuff on the back of the paper was attached to the cast iron and sort of melted into it. I tried to scrub it off with soap and water, but there is still a spot. I also cooked some sausages in it, and noticed there was a black/sticky material so I soaked for a day in water – huge mistake (should have known better). It left rust marks in my sink which I can’t get out and now the inside looks really funky. Is my best bet to scrub the hell out of it and reseason? What do you recommend? You’ve probably moved on by now, but it all depends on exactly what thevpan was wrapped in. If it was wax paper, then try folliwing step 1 of the article, then rinse clean, dry, then fill thebpan halfway with a simple oil (vegetable or Crisco), and heat to medium (have lid and a CO2 extinguisher handy, just in case). Let cool, drain the still-liquid oil off, then perform step 2 (reseasoning). If it was any kind of plastic, it is unfortunately bryond saving. Plastics when heated to melting tend to smoke or fume, and to get it to melt out would require blowtorch heat, which will damage the metal’s properties. Hope you’re OK now. Well one sure way I was taught to do to the cast iron is every year in the spring when you burn off the part of your garden to put a lettuce bed ( it needs the ash ) once the fire is going place your iron skillet in the fire and go back and get it out once it has cooled. It will burn off any and all crud build up on the inside and the outside wash it and use lard not shortning but lard smear it all over the inside of the skillet making sure to get the sides, place it in the oven on a low heat remove and wip it clean with a rag or paper towel. Repeat one time then smear a little more lard on the inside and put it up. My brother has benn cooking with cast for years. He has several nice skillets. I’ve recently took up cooking in them, too. I found an deep Griswold in a yard under a pile of leafs. That poor thing was completely rusted. With a little research I came up with about everything all of you have posted. I broght that poor thing back to life. It cooks like new. I used a medium corse steel wool to get the tough rust off and rinsed. Placed it on the middle rack of self clean oven (put a cookie sheet that you don’t use under it on the next shelf below to catch the gunk). I set the cylce for 2 hours. After the cycle has completed let it completely cool. I rinced it off and lightly brushed off the loose material. I put 70/30 vinegar to water in a container large enough to submerge the entire skillet. Left it set for a day. Warning…. too much vinegar will do more damage than good. So be sure to delute. Use gloves on to remove. Rince thoroughly, dry with paper towel and let sit for short time to dry, but not to long. It will start to rust again. Coat the entire skillet with bacon grease or Cristo, place upside down in the oven at 250 degrees for 1.5 hours. (Dont forget the cookie sheet! What doesn’t aborb in the skillet will drip). After the skillet has cooled coat the entire skillet with Cristo, handle too. I repeated the seasoning a few more times after the first. You would never have known it was buried in a yard for so many years…. I apologize for my misspellings. I entered this on a small cell phone. I had a sticky iron skillet from using the wrong oil to season it. I have found the best is grease is lard. I would never cook with lard but it seasons the skillets nicely. I worry about using bacon grease because of the salt and chemicals. Lard may be hard to find but it will keep for a long time if you keep it refrigerated. You’re totally right Linda. Lard would be best. It can be a bit tricky to find though these days and I’ve had good luck with bacon grease as long as you render it correctly. Thanks for the suggestion! Hi! I found some old Le Creuset cast iron pots (no enamel) at a thrift store that I would like to get seasoned, but they have wooden handles. Do you think I could still put them in the oven at 250? The handles are removable, I would think. We bought a four burner gas griddle grill. The griddle is cast iron. My husband did a horrible job cleaning it the last time. I spent two hours scrubbing it with hot water! Salt and baking soda to get the grease off. The re seasoned. Need to go check on it again. Question is, grill is stored outside with a grill cover over it, not a lid. Would humidity cause it to rust also? Wondering what would be the best way to care for this with it being stored outside? Thank You! I meant scrubbed to get the rust off. Cover the entire grill with a tarp or insulative cover whenever it is cool and dry. 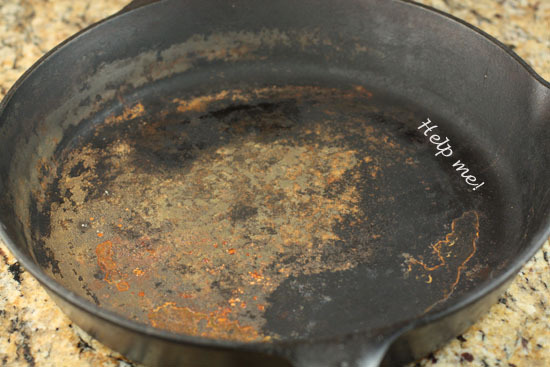 We got a cast iron skillet a couple years ago and it is one of the enameled ones…it looks like it is either rusting or the enamel is coming off or both…would it be ok for me to do this to it, to scrub it and reseason it??? I have an old cast iron skillet thats been past down for several generations. The problem is that suddenly I have a large hairline crack that goes all the way thru the pan. I found this out when i poured oil in it to fry chicken. All of a sudden I had oil pouring out the bottom thru the crack. Is there any way to fix this or is it a lost cause? If it cracks like that it’s done. No way to fix it… time for a new skillet! Clean all oil off of the pan (Dawn works best) and take it to a blacksmith. You can barter with the Amish or Mennanites, the craft is alive and well with them. The 250 degree with bacon fat method of seasoning works, but it isn’t as good of seasoning as other methods. The best that I have found is to heat the pan in a 200 degree oven, pull it out and wipe it with a very thin layer of Crisco. Stick it in the oven at 350 degrees for about 10 minutes, and pull it out and wipe it out again to remove any fat that has pooled. Now stick it in the oven at 500 degrees for an hour. The 500 degrees turns the fat into a polymer layer which is what makes it non stick. The 250 degree method works, but the polymerization takes a lot longer to achieve. 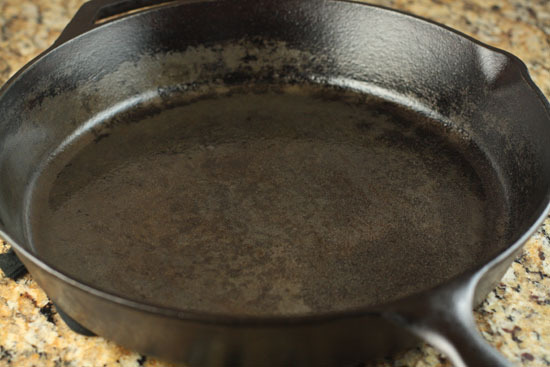 Myth: Washing a cast iron pan with soap will ruin the seasoning. True or False? : False, in most cases. A well-seasoned pan will be armored with a reasonably tough, near-plastic layer of polymerized cooking fat and carbon, capable of withstanding cooking temperatures of several hundred degrees. Although normally unnecessary, washing with warm water and regular dishwashing liquid using a non-abrasive pad or scrubber will not materially affect a well-established seasoning. 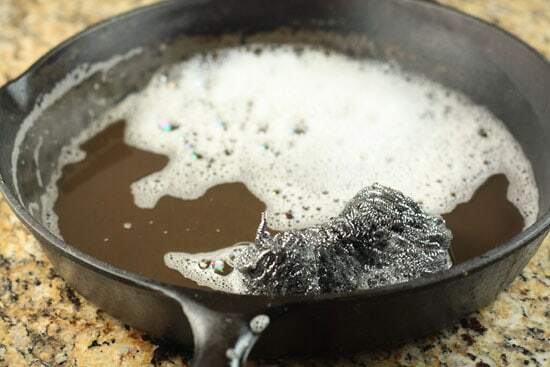 Cast iron pans should not be left submerged in water, however, and certainly should never be put through an automatic dishwasher cycle, regardless of how well-seasoned they are. Origins: The prevalence of lye as a soap-making ingredient pre-20th Century is a possibility. Also, a very basic initial seasoning may well be removed by a scrubbing with dish soap. Myth: The best, easiest way to clean build up from a cast iron pan is to burn it off in a fire. True or False? : False. While fire will indeed typically completely remove build up, intense heat will often damage the pan, either by warping or cracking it, or by potentially altering the molecular structure of the iron, making it irreversibly scaly. Origins: Most likely from frontier era camp cooks who would have had no other way to refurbish heavily encrusted pans. I received a vintage griswold skillet from a lady who used either lye or electrolysis to strip the pan. She then used a thin layer of Crisco to season it. The pan is already a nice black color. Like you, I personally would use a natural fat (bacon grease, tallow, real lard) to season my pan. I would NEVER use Crisco, Pam spray, etc. in my kitchen. I am wondering what I should do to begin using my pan. Should I be concerned about the Crisco getting in the way of the seasoning I want? Should I simply begin with a good scrub with salt and hot water or soap and hot water? Crisco provides a good durable base season once polymerized. Just add to it with what ever fats you normally use. Someone gave a cast iron skillet for Christmas once. I didn’t know anything about them, so like I do with every new kitchen utensil I cleaned it before using it… with soap.. I stored it and one day when I see it, it was completely brown. I thought I ruined it, so threw it away :’ ( When I saw in pinterest that I could clean it, I was mad, lol. I threw it away before even using it once. I bought a ten inch Griswold skillet that appears to be nickel or chromium plated. The first time it was washed, the water ran red with rust even though the surface is smooth and a light gray color with so suggestion of rust or pitting. Any explanations? Or, suggestions as to future care? Just a note for those of you concerned about lye, my grandmother made hominy in her cast iron using lye and while it definately removes the seasoning (no there was no black residue in the hominy) it never hurt them; she just reseasoned them afterward with a coating of either bacon grease or lard which she always had on hand. I make cornbread and pineapple upside down cake in mine all the time and it doesn’t stick. I put some Crisco into my cast iron skillet to heat before frying and found grease all over my stove. Seems that there is a crack in the skillet. Is there any way to fix it so that it can still be used? I inherited a cast iron pan from my grandma. I really don’t think she ever seasoned it. the question I have, is on the OUTSIDE of the pan, it’s crusty. should I use the same method to try to get the crust off, as recommended for the inside? Hey Debbie! Yes. You definitely can. Cast iron skillets are the same material throughout so you can scrub and reseason the outside as well as the inside. When I do mine, I usually do both just because it’s such a process… I just do the whole skillet when I do it! Good luck! I just got several skillets from a man who was moving. They have not done anything with them for some time and have mostly surface rust. I was thinking of using a wire brush on a drill to get it off before doing further cleaning and seasoning. I will probably season them on my outdoor grill when I get to it. I mentioned to another poster how I bought a Paula Deen pre-seasoned Dutch oven that turned everything black and stunk horribly. Anyway, it eventually quit doing that over the years, but it sticks horribly. I put it in the wood stove like I do my other skillets (which turn out beautifully) and this thing looks AWFUL, like a Lava rock. It turned red and blue and is as rough as a cob. I assume it’s cheap made metal and needs trashed for a good brand. Now to my question, which brand is good? Thank you in advance. Hey Susie, I’m a big fan of all Lodge cast iron products. They are exceptional and not ridiculously expensive. Another option though is that you can frequently find great, old cast iron skillets at yard sales and stuff and with a little reseasoning and TLC they can be brought back to life! It take’s me one hour to read all the messages and was very interested because I buy 3 cast iron about 15 years ago and now I know to use them thank you very much. I live in France. I have some cast iron skillets that belonged to my Mom and they were left in a storage shed and are now coated with lint or dust lint, does anyone have a suggestions of getting them back to normal. These pans are almost 70 years old and I want to pass them on to my Granddaughter. Thanks for anyones help. I forgot to check the notify box. After I use my skillet I run hot water and dry it- the rag is always brown- is this normal? About forty years ago my mother rescued some found cast iron pans by first putting them in her self-cleaning oven through a cleaning cycle. This burned off all of the crud, and they needed very little scrubbing before seasoning. It cleaned the outsides off, too. Worked like a charm. Wow! Cool idea Dorothy! Thanks for the tip! Hey Kate! I really think you’re probably okay. I’d take some paper towels or a dry, clean rag and wipe it down really well. There shouldn’t be any oil pooling anywhere but a very light shimmer of a coating. If you wanted to even out any streaks, you can add a little more oil and rub it in really well all over. Then I would turn your oven down to like 250 and leave it in for another 2 hours or so! Good luck! The dealer at the flea market told me to use a cast iron pan that does not have a ring on the bottom so it sits more flat on a glass top stove. When my skillet gets gunky and needs to be cleaned I through it in the campfire (or an open fire) and leave it for at least an hour. All the gunk is burned off and then ready for re-seasoning. Be very careful removing from flame ( let fire burn down) because it is going to be very hot. Works great for me. God bless. I cleaned mine like your instructions and when done it was sticky. What went wrong? My cast iron skillet has acquired a sticky residue. I have scrubbed it and reseasoned it twice but is still there. How do I fix this? Hi Nick! I tried to get through all the comments (really I did) but I kept falling asleep. Forgive me if I am being redundant. Throw the most godforsaken cast iron whatever in a self cleaning oven and self clean it. Boom. Now wash it good using soap & water and a wire brush to get off any resistant flakes of rust. Put the cast iron in a warm oven with a very thin surface of oil on it & heat at 250° for 1 or 2 hours; repeat as desired. Ignore the rust on your rag the first time you wipe it before starting the seasoning process. 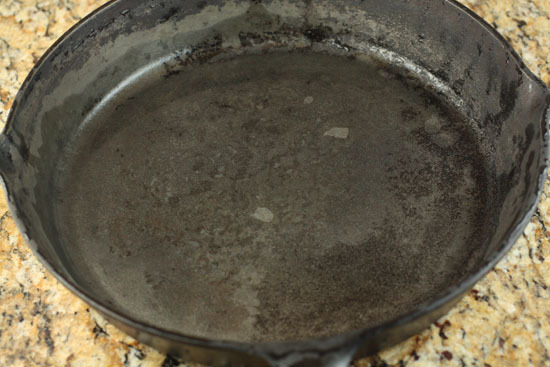 Rust will not come off on your rag after the first time you season the pan after wiping with oil. Boom again. Now about that nonsense of taking off the seasoning with soap: does ordinary soap take the seasoning off your Pyrex? No. Only elbow grease will do that. Just heat the cast iron, heat the oil, wipe out, then use. Ha! Thanks Suzanne! I’ve never tried the self-cleaning idea but sounds great! I have 3 Cast Iron Skillets that I got in the early 1950’s when I got married. We seasoned them in the back yard in a burn barrel and I still use them all the time. I wash them with soap and water if I need to. Then I dry them with a paper towel and put back on a burner on the stove to completely dry them. I have never re-greased them and have had no rusting. I love them, but they are really heavy as I get older. (81 years young) I hope my daughter will keep them when I am gone. She did take one a few years ago, my second largest. As I had 4 sizes. Do you mean 250 degrees celcius or Fahrenheit? 250 Celsius might be a too hot? THANK YOU!!! I absolutely needed this. I’ve had a rusted cast iron skillet for months. I’ve tried using steel wool scrubs but of course I took the “no soap in the cast iron” too literally and never tried to scrub the rust off with soap. Duh! I can’t wait to reseason and start using my skillet again. I’ve missed cooking with it. My pan is about 40 years old- it was my mother’s back in the day. I steel wooled it but couldn’t get rid of the rust so got 120 grit sandpaper. It did better but now I see a silver color under the black. Is it worth keeping? A good friend of mine lives out in the country. Once a year he hosts a party with a huge big bonfire at his place. Not everyone even realized it, but he put all their old cast iron skillets into that bonfire every year. The fire burned off all the old burnt-on grease and left them looking great. Weird, but true! Hi, you Q&A is so long great job, I have question, do you season you skillet upside down on the oven? Hey Andrea! I didn’t but I have seen that method and it shouldn’t really matter. Good luck! Thank you for your answer, it is just that when you do it upside down the EXTRA fat drops and it burns really bad and I guess that if you do not turn the skillet upside down that extra fat will burn on the skillet….please give me your opinion, love to know. Hey Andrea, you shouldn’t really have extra fat. You can wipe out all extra. You just need a very thin layer on the skillet. It shouldn’t drip. if it does you have too much. That said, I never really do the upside down thing, but either way should work! What if you can’t get the rust off? Hey Jim, I have a skillet like that also. As far as I know there is no way to re-shape it… but like you said, it’s still usable for many things.